Turkey Day Tutorial: The Big Bird! More than any recipe, this is the one that terrifies novice and seasoned cooks alike. You can breathe easy. I’ve figured out the hard stuff so you can be the hero. Remove the turkey from the brine and pat dry. Place breast side up in a recyclable foil roasting pan. No need for more dishes right? Oh yes, and I should have said before You see that plastic pop up timer? Take it out! I’m yelling at you now, TAKE IT OUT!! That stupid little piece of plastic has been the ruination of countless roast turkeys! The reason being, it’s calibrated to go off at a much higher temperature to keep the FDA happy. If at all! I’m begging you, use a probe or digital thermometer inserted in the thickest part of the thigh meat; (which cooks slower than the breast meat) when your dark meat is done (165 degrees) your white meat is too. 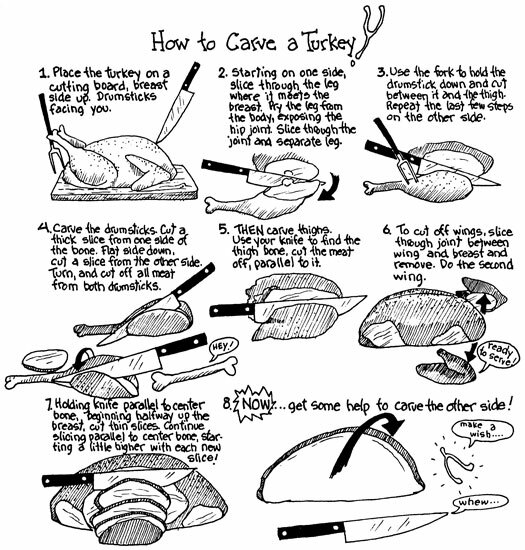 Tuck the wingtips under the body of the turkey. Fill the cavity with the lemon and garlic. Tie the legs together with kitchen string. Let the turkey stand at room temperature for up to an hour. Remember putting cold meat into the oven extends the cooking time and makes for a dry bird! With your hands, smear the butter all over the skin and sprinkle with salt and pepper. Preheat oven to 375 degrees. Place the oven rack at the lowest position. Insert your digital meat thermometer into the thickest part of the thigh and set the timer function to go off at 165 degrees. 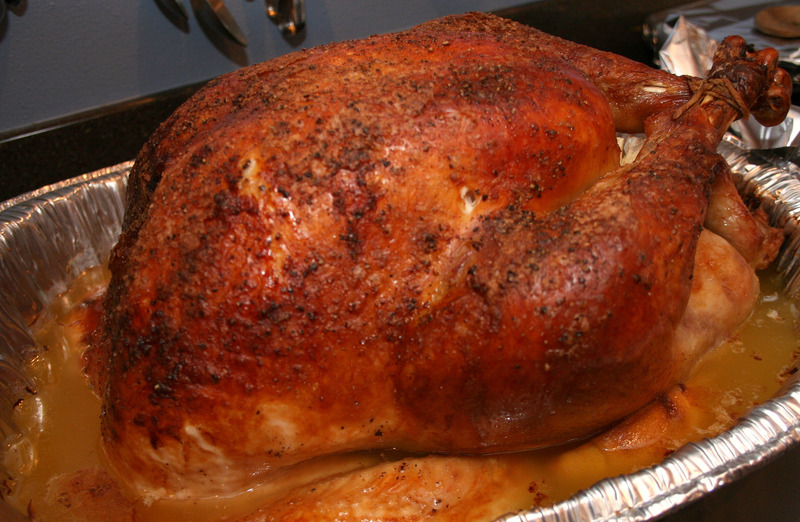 Roast the turkey, rotating the pan every hour until your timer goes off at about 2 ½ to 3 ½ hours. Let the turkey rest for about 30 minutes before carving. Aw that’s very cool! I hope you’ll let me know how the recipes work for you.